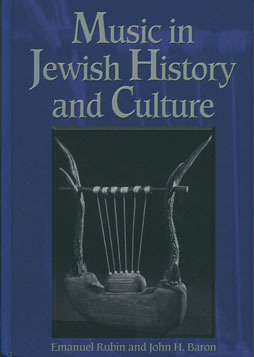 In a carefully chosen title, Rubin and Baron set about to teach not only Jewish music but to give the reader a handle to understand their working definition of Jewish music which is “Jewish music is music that serves Jewish purposes.” Thus Music in Jewish History and Culture is a title that tells the reader that any music “that serves Jewish purposes” in the course of time, various places and for various Jewish cultural or religious purposes might be construed as Jewish music. This is functional music. It must be at the service of those in the community for religious, spiritual, national, psychological, artistic or cultural matters. In the end, there are many Jewish musics. These are not only the product of the ages past such as cantillation, nusach or synagogue modes, but also the music of the streets of today’s youth in Israel or elsewhere. This is music of the Jewish artist, or the forgotten artist of Yiddish or Ladino or Hebrew song, or the multiple artists of other folks songs. These are the musics adopted from other cultures but seen through a lens under a spell of the Jewish neshama. For all this, the authors try to explain Jewish music and to put it into perspective. This book is dense. It’s not an “easy read.” Rather it is a text to be studied and used as a reference. The fifteen convenient chapters give it an ideal structure to be used in the modern college classroom. Indeed, it seems the purposes of this book come out of the decades of experience of the two authors in teaching Jewish music classes at University of Massachusetts Amherst and Tulane University. In full disclosure, this writer studied music at Tulane with John Baron, but this study was for classes in music of European Baroque and Classical music, Baroque theory and Conducting. There was little to nothing of Jewish music taught at Tulane then, although a very indulgent professor aided a rather persistent undergraduate to explore Jewish music and allowed her to write an undergraduate thesis on the history of the emergence of Reform music. But in those days, he asked that awful question “What is Jewish music?” and for every answer the professor had a much more brilliant exception to any rule. Baron had studied with Eric Werner (who, in the Jewish music world basically had rock star status in those days), and a litany of great musicians at Harvard, but this student never truly understood then the amazing level of yichus (connection) from which his love of the music stemmed. One day Baron marched this writer into his office with a reel to reel tape recorder at the ready. He played a series of chants and asked, which one was “Jewish”. The student could immediately identify Ashkenazi Torah and Haftorah chants. “What precisely makes them Jewish? How are they different than the others?,” he pressed. The author couldn’t articulate clear answers although she could be descriptive. But what of all the other chants? Some of the others were from non-Jewish cultures, but some were also Jewish. These were from other parts of the world; remote places an undergraduate knew nothing about. In order to master this subject, he warned his student, you’ll have to learn several languages, general and Jewish history, musciology, Jewish studies and world religions, something of architecture, archaeology, and sociology all in addition to ethnomusicology. Can you do that? At Tulane, under the tutelage of Baron, the author launched into a senior thesis and also began the study of German, which Baron considered essential for the study of Jewish musicology. Some thirty years have passed. Jewish musicology has grown considerably, especially with the aid of a generation of Israeli musicologists. A very handy book such as this would have been a wonder then. True, there was Gradenwitz, but in the older edition. We were still relying heavily on Idelssohn. The majority of books’ scope of Jewish music writings were focused on narrow topics and there was very little way to tie it all together. Today we have a much better situation. There is the new Grove’s Encyclopedia articles on Jewish music, a new edition out this year of Encyclopedia Judaica, and Rubin and Baron. All the elements of the multidisciplinary study of Jewish music are present in this book. Here in one book is a very good, solid overview of the scope of Jewish music laid out in clear, unbiased language. This is a very dense read, (reminding me somewhat of all those undergraduate hours spent in mastering Grout) but with a specific purpose: putting Jewish music in its cultural context and put squarely into the midst of Jewish culture. Rubin and Baron’s book is encyclopedic in the amount of information on Jewish musicology. In terms of breadth and factual content, it is, by far, the best book in English of its genre on the market today. There are two or three additions to this book I would want have wanted to see, such as more musical examples in the text, a discography to go with each chapter, and a CD. I understand that there may be reasons to leave those out: an appeal to those who are not college music students and those who don’t read music. Anyone can read this book. It’s in one language (English) with a lengthy glossary in the back for any Jewish terms. In terms of discography, the authors may have not wanted to “age” the book with a current discography. Nevertheless, it may have been an excellent addendum in the back near the bibliography. This lack of discography also speaks to the use of this book as a textbook. Any teacher or professor can easily add their own readings and listening list without a predetermined emphasis from the authors. Today many books are coming with CDs, but this book would require so many items to cover all the chapters that it is understandable that to have a limited 70 minutes of music would be nearly impossible to choose what to include. This book is intended as the ‘guide’, the outline, and it is up to the individual teacher to fill in. Nevertheless, students reading this text will have a very thorough framework from which to base a discussion or to understand what they are hearing. Any lay reader can use their own collections of Jewish music and understand them better with this work at their side. An interesting feature of this work are several sections (with gray pages) that the authors call “Historical Interludes”. Here the background of Jewish history must be filled in to help the reader place the next chapters in context. The information is not about music, but about general Jewish history. These historical interludes are also used to frame some of the context for the next section, particularly the section on the Haskalah and the Holocaust. Even though the original scholarship of the two authors is embedded in this book, they have relied heavily upon secondary sources and the writings of others to produce large portions of the book. They have taken the best of the works and summarized the findings, weaving the story of all those different works into one narrative. One occasionally wonders at the choice of secondary resources, such as the reliance on A bisl Yidishkayt website for their background on klezmer musicians, when all the major current books on klezmer are included in the bibliography. In terms of accuracy, this work is quite good. There are some minor errors, but nothing that detracts from the reliability of the work as a whole. As with any print book today, some materials become outdated by the time they go to press, such as addresses for websites. One more area may need consideration for the future is the inclusion of women. While a great many women are mentioned in this work, more discussion of their roles and a fresh reevaluation of womens’ contributions to Jewish music would be welcomed. For the most part, Rubin and Baron are giving the reader cogent summaries of the best knowledge to date on these particular subjects within the scope of Jewish musicology. In some cases, students will want to go to the original sources for more details. Very often the scope of the book does not allow for the kind of depth one might wish on certain topics. Nevertheless, this book will lead you to the right place. The range and scope of the subjects covered is enormous. For all this, this book is highly recommended for all libraries, public, high school, and academic, as well as an excellent choice for the well-read Jewish home, or non-Jews interested in a fascinating aspect of musicology.